How many times have you told your children they better watch out, they better not cry and they better be on their best behavior because Santa is watching? The fear of not making Santa's Nice List has undoubtedly kept untold numbers of kids from misbehaving for decades. Nobody wants to be on Santa's Naughty list! If you want to encourage your kids to stay on Santa's good list and reward them for their good behavior, here are some fun ways to do it. So how, exactly, do you get on Santa's Nice List anyway? Every parent has a different answer to that question and now you can make sure your kids know exactly what they need to do to get on your (oops, I mean... ) SANTA's Nice List this year. All you need to do is customize the free Nice List Guide from Package from Santa with five things your child needs to do in order to make the list. You can choose from common options such as "remember your manners" or "be nice to your brother/sister" or you can fill in your own options. The list is already populated with five other items Santa wants all kids to do - be kind, respect your family, smile, help others, and believe in Santa Claus! After you enter all your options, simply provide a valid email address and Package from Santa will email you a link where you can go to print your personalized Nice List Guide. Then relax and forget the nagging. You'll have a handy reminder you can point to every time your child is in danger of ending up on Santa's Naughty List. So they'll be on their best behavior through the holidays! Of course, if you print out a list of rules your kids need to follow to get on Santa's Nice List and they actually stick to those rules until Christmas, you'll want to reward them for their good behavior. A Nice List certificate from Santa is a great reminder that Santa always knows if you've been bad or good. 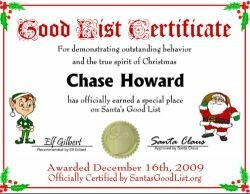 If you're going with a purchased Santa letter, several of the top companies offer very professional, authentic-looking certificates that are sure to make your kids feel special for making the good list (see below). 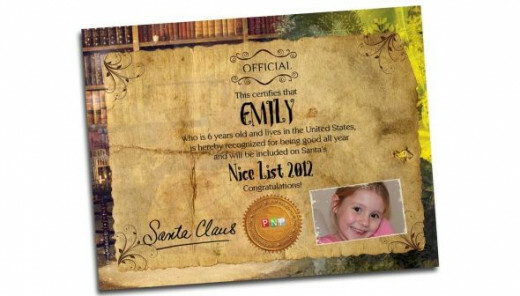 you can purchase a printable Santa's Nice List certificate like the one shown at left at Christmas Letter Tips.com. The best thing about this certificate is that you can use it over and over for all the children in your family, so you'll never have to pay for another Nice List certificate. 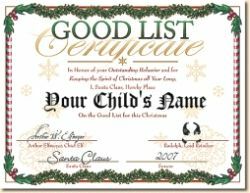 You'll also find Santa's Nice List certificates at Santa Letter Templates.com. You can buy them separately or paired with printable Santa letters, such as the letter and certificate shown at the top of this section. 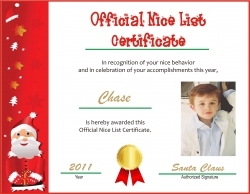 You can also get Nice List Certificates at Printable Santa Letters.com. This site offers three different packages of letters from Santa. The gold package (shown here in the image at left) includes a letter from Santa, a letter from Rudolph, an autographed photo of Santa Claus, a personalized Nice List Certificate and two envelope designs. You can't buy the certificate individually at this site. You'll need to purchase the complete letter package, but the price for the gold package is only $4.89, which is less than you'd pay for a single letter from some companies selling letters from St. Nick. If you have time and want to make your printable list seem even more authentic, use the USPS' Christmas mailing service to get a Santa postmark or North Pole postmark for your Good List certificate. Photo Nice List Certificate from PNP - And a personalized video from Santa, too! 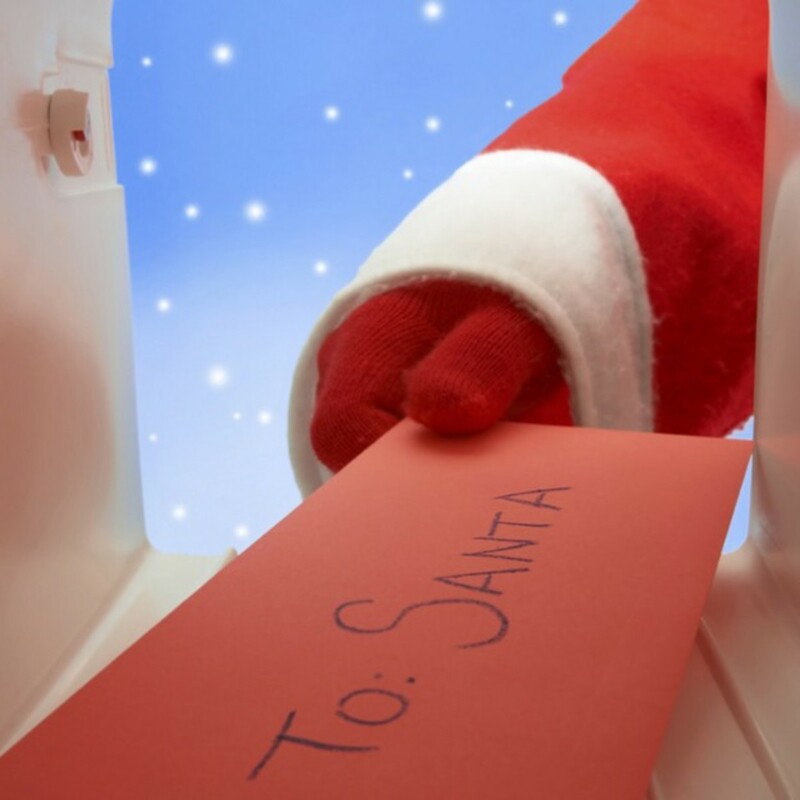 At Portable North Pole (PNP), you can create a photo-personalized Nice List certificate that includes your child's name, age, location, and a photo. This is just one of the many personalized items you can get from the site, which is known for offering amazing video messages from Santa. The free video is about 4 minutes long and includes up to 20 elements you can personalize, while the premium video includes other personalization options and runs about 90 seconds longer. Here's a great little item to stuff inside your child's letter from Santa Claus or for Santa Claus to bring on Christmas Eve - an official Nice List tree ornament. All of the ornaments below can be personalized with the current year and your child's name. Click an image to learn more. There's a great new service called Instaletter that allows you to create Santa letters, Santa Good List certificates and letters from other characters such as the Easter Bunny and Cupid. For an annual membership fee of just $14.99, you can create unlimited professional quality Good List certificates, Santa letters and other fun letters for kids that you can print instantly at home. The system is easy to use, has many creative options, and if you have two or more kids in your family, it's a great bargain. "He's making a list, checking it twice, gonna find out who's naughty and nice." If your kids have been really good, you may want to splurge for an authentic-looking Good List or Nice List certificate from Santa, and if you're already planning to purchase a Christmas letter from Santa, these are great add-ons. Imaginary Greetings offers Santa's Good List Certificates like the one shown here. They're printed on heavy stock, are signed by Santa and his chief elf, and include a "hoof print of approval" from Rudolph. They also have a gold foil seal to make the document look very authentic. Package from Santa offers a very official-looking Santa's Nice List certificate. Like the Good List certificate above, it is not only signed by Santa himself, but also has a hoofprint from Rudolph and a gold foil seal to add authenticity. Both certificates are personalized with your child's name and year. Another alternative is to buy a Nice List announcement card. 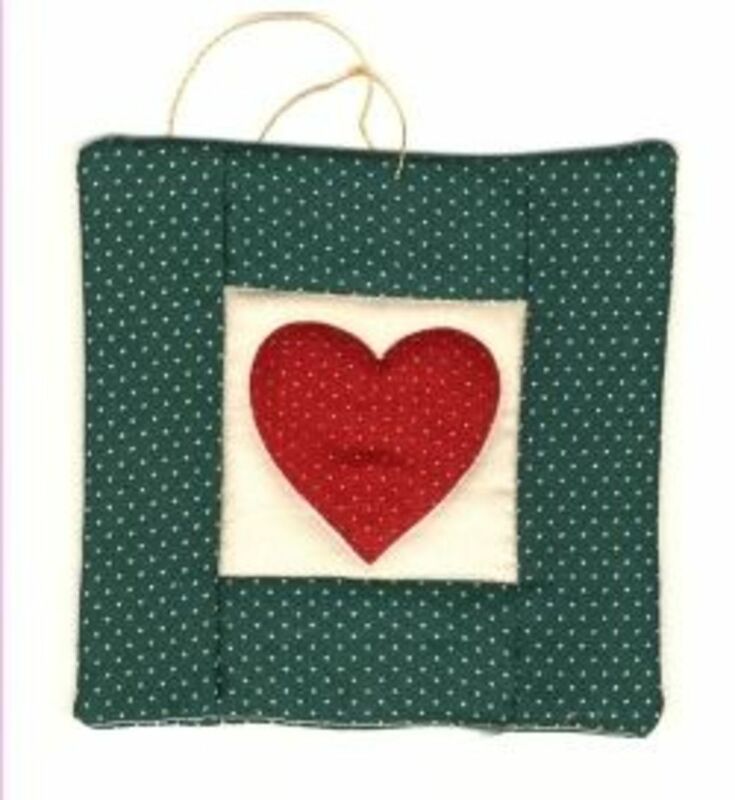 This simple card can be customized at Zazzle to include your child's name. (Look for the Personalize It! arrow.) The outside of the card says, "Look Who's On Santa's Nice List!" and the inside says, "Congratulations! You're on my Nice List this year. I'm so proud of you! Love, Santa." This is an inexpensive alternative to buying a more expensive certificate and allows you to have a professionally printed card with your child's name on it. This card would be great to leave out with the empty dish of milk and cookies or with the presents. Disney has a fun way to show your kids that they've made it on Santa's Nice List. Simply register or login to Disney Family, upload your child's photo and name, and click a couple of buttons. You'll get a cute video you can play for your child or email to family or friends to show that your child has made the list. Unfortunately, there appears to be only one version of the video and you can't add two names, so if you've got two kids, you won't be able to make separate videos for each of them (unless, of course, you think they won't notice that Santa and Mrs. Claus are saying and doing the exact same thing in both videos). The service is completely free, but is only open during the holiday season. 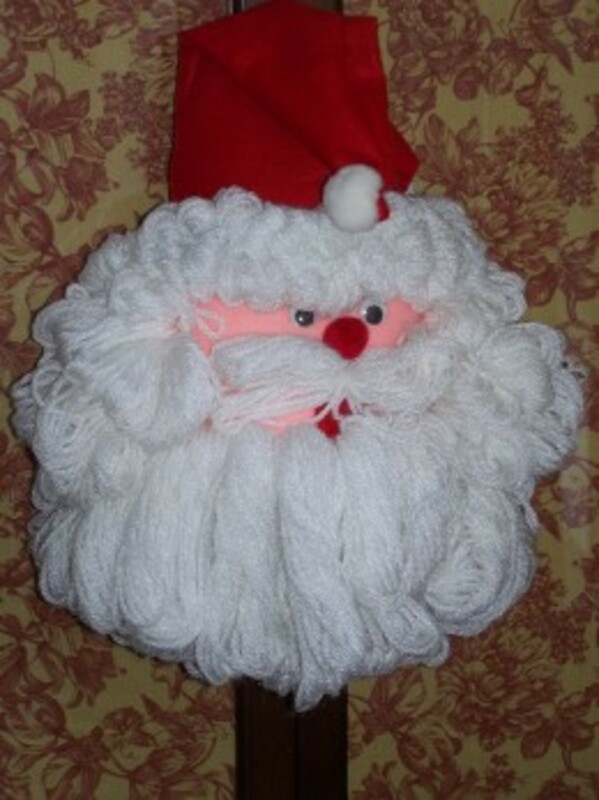 Here's a funny story about how NOT to behave if you want to get on Santa's Nice List. Kids will get a kick out of this silly, rhyming story written by Dean Koontz about Santa's evil twin brother, Bob Claus. There's no question Bob deserves to be on the Naughty list for his Christmas-time pranks. From Amazon: Charlotte and Emily are determined to save Santa from his mischievous twin -- Bob Claus -- who has not only stolen Santa's sleigh and stuffed his toy bag full of mud pies, cat poop, and broccoli, but has also threatened to turn Donner, Blitzen, and the others into reindeer soup! Are You On Santa's Nice List This Year? Thanks My daughter is on Santas nice list she's only three but she loves Christmas and all the activities going on, and also the North Pole and Santa Claus websites. An excellent lens. Thanks for this. I really like your lens, I didn't know must of this existed. Thanks so much, and be blessed. A really nice presentation of niceness. :-) Cool ideas. Thank you! Nice lens. You must be on Santa's nice list. Nice lens,you did a great job. Hope as you say i could make this Christmas special for my kid with his name on Santa's list. Sweet lens. I want to be on Santa's nice list! This is a great site! I love using Squidoo to find stuff for my kids to read, watch, learn and play online. I found a great index of kids websites on http://www.squidoo.com/kidswebsites. It has info on E-Learning, games, kids TV and software. Keep it up! Nice! My kids will definitely be happy when they see their names on Santa's list. Thanks for sharing. Will share this lens to some of my friends. Hope you could visit my lenses as well.